A journal of my adventures in real estate investing. This weekend I got into the Bathroom Hole House and took some pictures. I have made a video walkthrough of this house. The house as a separate apartment attached – a mother-in-law suite. This suite has two entries, one form the garage and one in the back. There is no way to get from the main house to the mother-in-law suite. The mother-in-law suite has a living room, dining room, kitchen, bedroom and bathroom. It also has a separate power meter. I am not sure what to do with it. Should I leave it as is, or open it to the rest of the house and remove the kitchen and extra power meter? 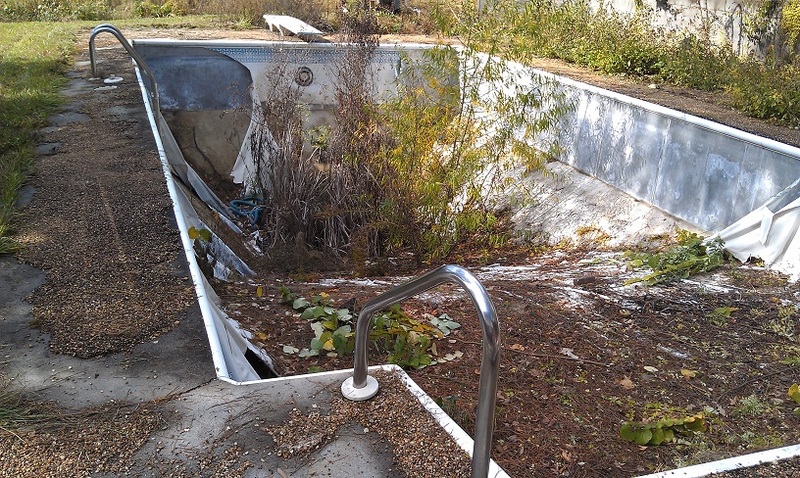 I am not sure what to do about the pool. I have left messages with a couple of pool repair companies and I am waiting for call backs. I need a repair estimate before deciding if I will keep the pool, or fill it in. I have contacted the top real estate agent in town about listing the house. She is going to meet me next Monday and give me her advice on this house. I hope she will give me some insight into which way to go with these two options. Makes you want to take dip, doesn’t it? My offer has been accepted on the Bathroom Hole house. Initially, I was not able to get into the house. A small bathroom window was open and I tried to climb in and I barely fit into the window. 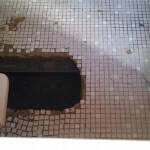 When I got half way in I saw a hole in the bathroom floor – right under the window. The hole was about 3’ X 1‘ and I would have fallen in if I climbed in. I have never been inside this house. I conservatively estimate that this house will sell for $100,000 which I explained in a previous post. I will be getting it for $32,000. I do not have a detailed repair estimate, and I have not even been inside the house. I originally offered $23,500 as detailed in my original post. My agent had to enter the offer into a web site and there she found that there was another offer for $33,000 with no response. I increased my offer to $30,000, but it would be cash, close in two weeks, 10% earnest money, and waive the inspection period. I was hoping this sure-deal would carry more weight that the $33k offer – or at least get a highest and best request. The seller countered the next morning with $39k.